Okay I am admittedly biased because he’s the nicest guy I’ve ever met, but he’s also worthy of the title of this post. His Comedy Central show airs every Thursday at 10:00 pm, starting tonight! It has long been known that the Academy does not recognize comedy, and this year’s nominations were no exception. With the exception of Julie and Julia, none of the Golden Globe comedy winners were nominated for an Academy Award. Some insiders hoped that movies like The Hangover and (500) days of Summer would be nominated. However, this does beg the question of what exactly is a comedy? Though The Hangover is certainly a comedy, what about Up in the Air? Does that count? Apparently not, as it’s a “tragi-comedy.” Sigh…it’s all so confusing. Sandra Bullock may set a record as the first person to win a Razzie for worst actress and an Oscar for best actress in the same weekend. The coveted Golden Rasberrys are given out the day before the Oscars to recognize the worst in motion pictures. The nominations are for The Blind Side and All About Steve. Can you guess which is for the Oscar and which is for the Razzie? Sandra seems to be a good sport about it, stating in a recent interview that if she wins the Razzie, she will show up. 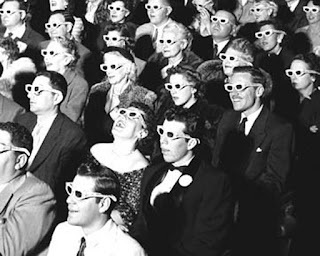 3D…The Wave of the Future or Just a Big Headache? So apparently the industry thinks that the box office success of Avatar is greatly attributed to the film being 3D. Though I don’t disagree, something tells me Cameron might be the only guy that can successfully execute this. Like it or not, here is the list of upcoming films that will be in 3D. Author The DishmasterPosted on February 3, 2010 Categories UncategorizedTags UncategorizedLeave a comment on 3D…The Wave of the Future or Just a Big Headache? Scream 4 is a go! Kevin Williams spilled the deets to MTV recently on his plans. As you can see from the earlier post, Oscar nominations are in. James Cameron is predictably up against his ex-wife, Kathryn Bigelow, for Best Director. Cameron and Bigelow were married from 1989-1991. Despite the title of this post, Cameron and Bigelow remain close friends and seem to be rooting for one another. In fact, Cameron even stated,”if [Kathryn] wins, I’ll be cheering.” Wow, how Demi and Bruce of them. Author The DishmasterPosted on February 2, 2010 October 23, 2018 Categories GeneralTags Jenny McCarthy, UncategorizedLeave a comment on Oscar Nominations!! It’s official! Idina Menzel Joins Glee! If you don’t know Idina, please watch the clip below. By the end of it, I’m sure you will be very excited. Author The DishmasterPosted on February 2, 2010 February 27, 2012 Categories GeneralTags UncategorizedLeave a comment on It’s official! Idina Menzel Joins Glee! Apparently Hollywood doesn’t have a sense of humor. Who knew? 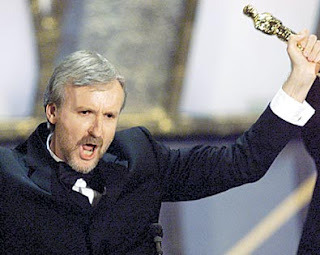 When James Cameron won the Oscar for Titanic in 1998 and declared himself “king of the world,” no one was amused. In hindsight, even Cameron himself seems to regret it. Is anyone aware that this was an actual line from Titanic? I think it’s time to lighten up a little. For some reason inflation seems to be the best kept secret when it comes to setting film records. While Avatar might have grossed an insane amount of money, it doesn’t even come close to Gone With the Wind, which would have earned 1.5 billion dollars domestically with today’s ticket prices. When Gone With the Wind was released in 1939, the Governor declared a state holiday, and tickets were 40 times the regular cost. Click the link below to see the list of top grossers when adjusted for inflation.